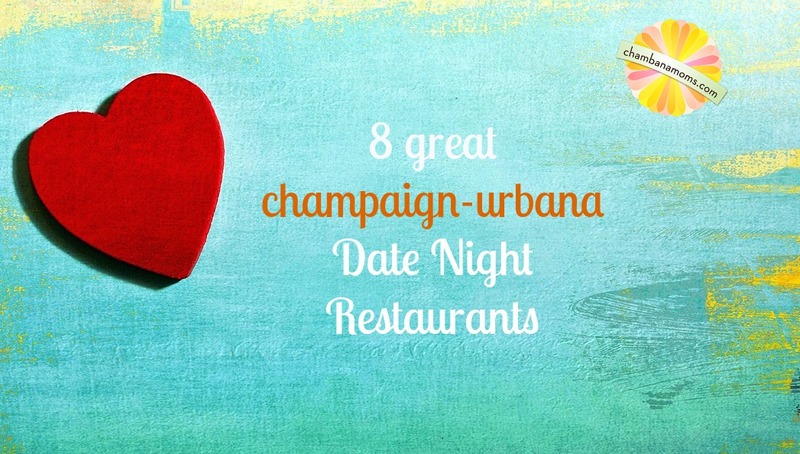 A list of our favorite date night restaurants in Champaign-Urbana and Beyond. Where to go when it’s just you and your favorite dinner companion. Maybe the grandparents are in town. Maybe you’ve splurged for a babysitter. Or maybe you’re taking advantage of one of those awesome “parents night out” events around Champaign-Urbana. No matter the reason, it’s date night, and you’re all about having a nice, leisurely grown-up meal. You know, the kind of meal where you don’t have to worry about taking the kid to the bathroom the moment your hot food arrives, or eating so fast you can barely taste what is in your mouth because the toddler is about to have a nuclear meltdown. Big Grove Tavern, downtown Champaign. Hands down, my typical choice. I love everything about this place — the atmosphere, the food, the people watching. And the popcorn you receive when you sit down, too. The chicken is mouthwatering. And the Brussel sprouts (a seasonal item) are one reason I look forward to the weather getting cooler, but sitting on its lovely patio makes this a great summer destination. Looking for a spot to meet up before dinner? Big Grove Tavern also has one of our favorite bars in Champaign-Urbana. Timpone’s, Urbana. An Urbana classic. Located on campus right not far from the Canopy Club and Krannert Center, this is a great place to eat if you are going to an event at one of those places — or if you just want to have some darn good food in a comfortable, relatively quiet place. Fish is a specialty; some people rave about the pizza. No matter what you get, I always leave Timpone’s feeling like it was a great value. Not that it’s cheap — it’s just quality at reasonable prices. Sakanaya, Campustown in Champaign. OK I’ll admit it, my husband won’t eat sushi — but if you and your partner do sushi, this is a great place. Walk in, and you feel like you’ve been transported somewhere else. It’s pretty small and intimate, with modern, upscale decor. Its menu is different than other sushi restaurants in the area and is moderately priced. Pro tip: go when the students are not on campus. See our Mom Review of Sakanaya here. Black Dog, Urbana and Champaign. It’s not that Black Dog isn’t family-friendly, because it is (and they make a darn good grilled cheese). It’s the wait (reservations are not accepted) that discourages us from bringing the kids. But when it’s date night, waiting in line isn’t nearly as stressful — and is a chance for some grownup chatter. Of course the main draw is the food, and head over there to find out why Black Dog was named one of Maxim’s top five BBQ restaurants in the country. One caveat: if you don’t want TVs interfering with your date night, don’t go here. Farren’s, downtown Champaign. The burgers are the main attraction here, and locals swear by the Elaine salad. But this upscale pub has some of the best specials in the city (put the turkey burger on the permanent menu, Carolyn! We will beg!). This is a great choice if you are going to the Art Theater or the Virginia, although beware of its no-reservation policy. Miga, downtown Champaign. Named by our readers as a favorite for Korean Food and also Sushi. Miga offers great ambience, superb service, and unique, delicious food. While the ambience at Miga features a contemporary, big-city feel that doesn’t require the long trip up to Chicago, the atmosphere remains warm and inviting. The flexible and creative menu, warm atmosphere, attentive service, and air of intimacy of Miga makes it a good choice for a special date night dinner out. Miga also has a great bar. For more on Miga, click here. Beef House, Covington, Ind. The Beef House is certainly kid-friendly and go as a family once in awhile for special occasions. But this was one of our favorite stops pre-children, and that’s how I think of it. And not many kids can sit for a three-course meal when you do soup, the fantastic salad bar, and the main course. And did I mention the rolls? BEEF HOUSE ROLLS! For a nice evening, the 45-minute drive from C-U seems like a vacation. Firefly Grill, Effingham Every time we drive an hour to Firefly for dinner I remind myself that my friends who live in the Chicago suburbs routinely drive an hour to get to the city for date night. But we don’t need an excuse to go to this destination, which features food grown in its own garden and fish flown in fresh daily. But don’t be fooled — there’s nothing pretentious about it. It’s comfortable yet romantic. If you like to eat outside, ask for a table on the screened in porch overlooking the pond.